Adam is a certified exercise physiologist and strength & conditioning specialist. He is officially joining the CSCM team on January 15, 2018 as Performance Science and Talent ID Lead. Adam has spent the last six years at Sport Manitoba, most recently as the Senior Manager of Athlete Development. In that role, he worked extensively with Provincial Sport Organizations and their athletes on their performance plans. 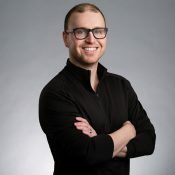 Adam has experience as a university lecturer, presenter for Canadian Sport for Life, and learning facilitator for the National Coaching Certification Program. He has worked with athletes from all levels of sport, including national teams, provincial teams, professional sport, and youth athlete development programs including NHL, NCAA, CIS, WHL and World Championships. He holds Bachelor’s Degrees in both Education and Physical Education from the University of Manitoba, as well as a Master’s degree in Exercise Science from the University of Pennsylvania. He is now in the final stages of completing his PhD from the University of Manitoba, focusing on performance optimization in elite circus artists. In addition to his sport system work in Manitoba, Adam works with the internationally renowned Cirque du Soleil and the National Circus School as a performance science consultant. He also played a significant role in the design, operational planning and fit-out of the $24 million Canada Games Sport for Life Centre. Adam believes in the adage that people have to know that you care before they care what you know.